Coconut water has become very popular in the past few years, and for good reason it does so many wonderful things for your body. But if you drink the kind that you can buy out of the carton, you might want to read this. 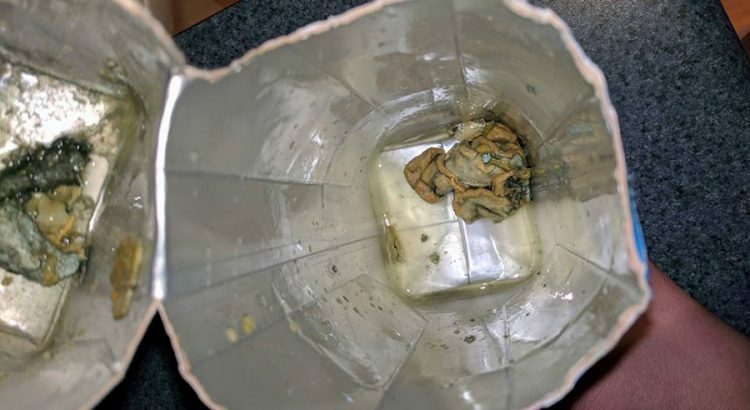 Imagine finding pieces of dead animals inside a store-bought fresh beverage. Barbara Evelyn Marie cut open her water because it didn’t taste right, and was disgusted at what she found. The coco water didn’t taste so fresh after the first few sips. And after her discovery of flesh in her coco water she definitely became ill. Having drunk that small amount, she suffered food poisoning with diarrhea and stomach pain. “Nothing seemed wrong with the packaging, the expiration date read July 17, 2017”, she said. The company reported that they are currently investigating this problem and their quality inspection team is working hard to understand how this may have happened.